Where Did it Come From? Why is it Accepted? 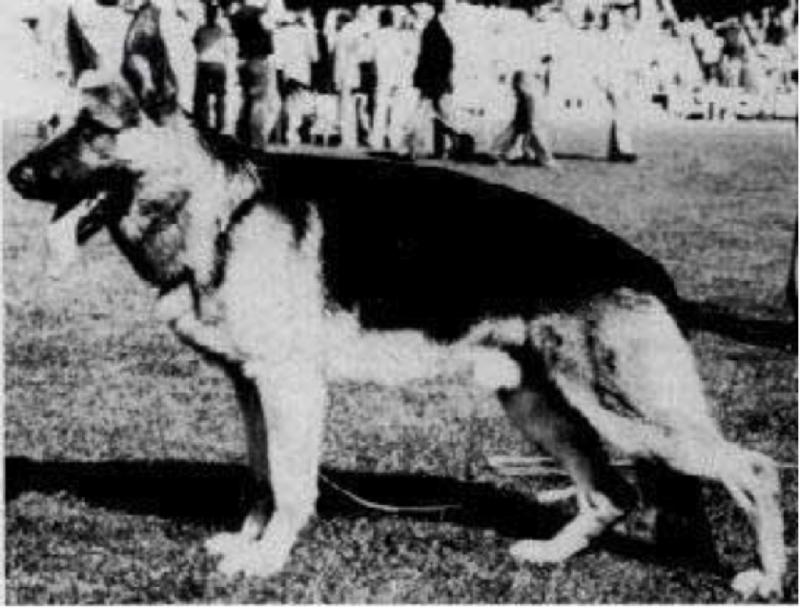 The debate about the topline of the 'German Shepherd Show Dog' has raged unabated for years, since around the late 70’s. The extreme downward lumbar spine bend which is increasing in terms of genetic frequency and which I believe I was the first to write about, exacerbated the spines curvature especially when associated with over angulation created by an overlong tibia. In the mid 90’s they started trending toward Fig 4. I could have used a number of dogs for the 4th photo but elected to use Jeck vom Noricum and the reason is explained a little later in the article. ​The question to be asked is what is it that has actually changed and is it good or bad? What has actually changed within the dogs spine from circa 1960 that has had such a physical and visually profound impact on its topline? The transition of the German Shepherd Show Dog spine circa 1960 > 2000 can be seen in the two skeletal drawings below - Fig's 5 and 6. The spine seen below in Fig. 6a applies to the majority of all pedigree breeds of dogs - not surprising as this is the spine configuration that applies to the ancestor of all pedigree dogs the Grey Wolf, the worlds optimum trotting canine. Unpleasant as it may be to hear, and contrary to the opinion of many 'experts', what is now commonly seen in its various degrees is a spinal malformation. This was initially manifested as a relatively modest rise in the 'anticlinal region' of the spine, see Fig's 2 and 7 - and exacerbated in many dogs by a distinct 'downward bend to the lumbar spine', see Fig's. 3 and 4. ​Note; The length and size of all bones in the above skeletons are identical in both skeletons - all changes relate to the change in the spine. What does the standard state? After all it is supposed to be the definitive arbitrator! ''The upper line runs from the base of the neck via the high long withers and via the straight back (thoracic and lumbar back) towards the slightly sloping croup without visible disruption. It goes on to say: The back is moderately long, firm, strong and well muscled. The loin is broad, short, strongly developed and well muscled. The croup should be long and slightly sloping approx. 23 degrees and the upper line should merge into the base of the tail without interruption’’. The withers (T1 > T5) should be discernibly higher than the back and I mean the whole back, thoracic and lumbar, not just lumbar. For the withers to be higher than the back means they have to have have a clearly defined slope. For an 'effective slope' to exist, the 'anticlinal spine position' must be clearly below the withers as seen when the dog is standing four square with the rear pasterns positioned vertically. The common practice of standing the dog with the far foot placed too far forward and over stretching the fore side foot lowers the anticlinal position thereby creating backline slope and this needs to be accounted for in this equation. 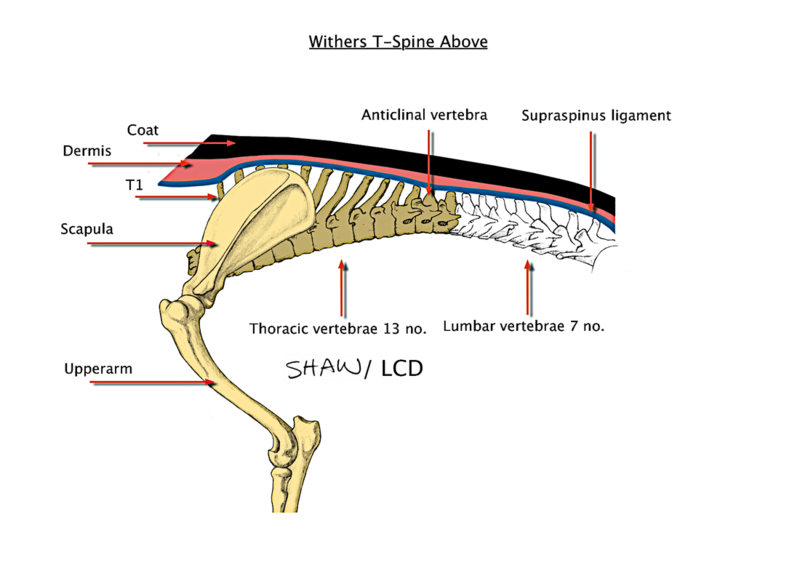 ​The back which is the section of the topline that goes from the end of the withers to the start of the croup i.e the balance of the thoracic spine T6 > T13 and all of the lumbar spine L1 > L7 including a small section of the pelvis to the pin bones, should be a ''slightly sloping straight line'', there should be no change in direction from the point where the thoracic spine ends and the lumbar spine begins - it should be an uninterrupted, seamless, straight, continuous line. 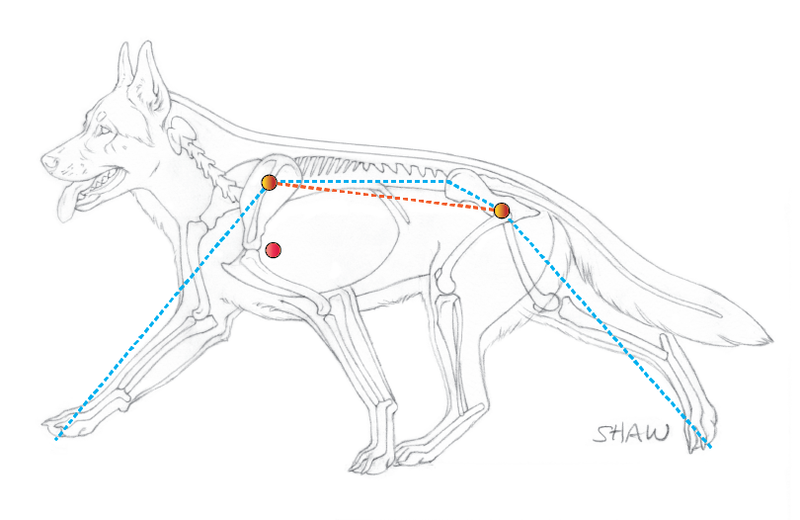 ​Whilst straight is straight, evolution has determined the lumbar section of the back of canines in its optimum form has a 'very slight rise' over its length. A 'very slight rise' over the lumbar region of the back is an indicator of well developed back muscles, and I place emphasis on the word 'very slight rise'. Having said this, I make the following comment; this 'very slight rise' is very different to a curve created by a very high anticlinal rise and or severe downward lumbar bend. As an aside, I add that if there isn't a 'very slight curve' to the lumbar spine, if the lumbar spine is literally 'dead straight' - be it dead straight and level or dead straight and downward sloping, or if the back is weak because the anticlinal region is too low as in the late 1950's Sieger Condor von Hohenstamm below, the transition of the lumbar back into the croup will not be smooth and seamlessly flowing. There will be a defined transition from the start of the croup [pin bones] and often a slight high set of the tail as seen below in Figure 9. ​What did von Stephanitz have to say in regard to the back? The photos below show the three main topline variables that one sees in the show ring today. When looking at these three photos it is important that the reader avoids the inevitable inclination of allowing the complete dog or even who the dog is or is owned by to influence what they are actually supposed to be looking at, which is the topline; withers, back, croup - impossible as it may be for some people, in the context of this article look at no more than the topline of the dog, base of neck to end of croup. Figure 9 - The upper line runs from the base of the neck via the high long withers and via the straight back towards the slightly sloping croup without visible disruption. ​How did the curvature to the spine come about, what is its impact on locomotion and why for many people today is it considered to be desirable, even critiqued by most breed experts as a straight back? In developmental terms the curvature that was initially seen was created by a rise in the anticlinal region of the spine, at the thoracic lumbar transition region and centred at the T11 - seen here in Fig.12. This raised the anticlinal region of the spine from its evolutionary position of being discernibly below the withers, see Fig.5, to being just below, level with or in some cases higher than the withers. The higher the anticlinal region and dorsal spinous processes the less defined the withers slope and the lower the anticlinal region and dorsal spinous processes the more defined the withers slope. To determine the height of the tops of the dorsal spinous processes within the withers relative to the tops of the shoulder blades is difficult by sight. Not impossible but difficult. The area really has to be palpated (and the thing you feel is actually the supraspinus ligament) to determine their relativity and this changes with the neck carriage i.e the tops of the dorsal spinous processes lowers relative to the tops of the shoulder blades as the dog raises its head/neck and vice versa therefore when doing a comparative assessment the neck/head position of the dog should be such that it is in a normal approx. 35 - 45 degree angle. 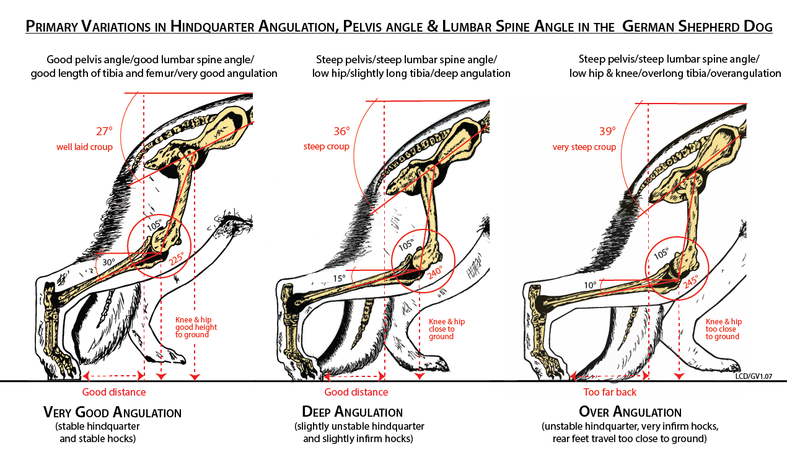 ​As an aside, a high inter withers dorsal spinous processes position changes the withers shape (narrower cross section) and increases the dogs measurable height - as seen in the following two drawings. 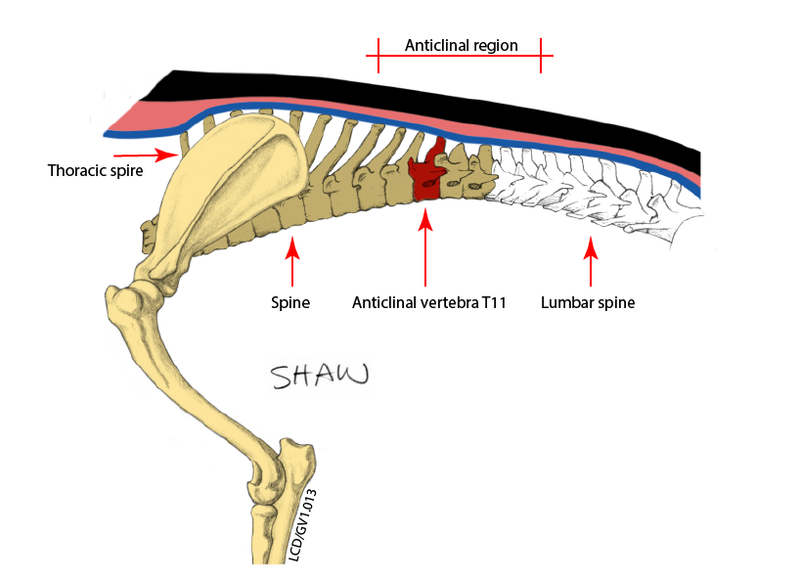 ​To show how difficult it is to determine the dorsal spinous processes and overlaying attached supraspinus ligament relative position to the tops of the shoulder blades by sight, the following dogs have been palpated and their thoracic spire ligament/scapula relativity is noted. ​Dependant on the anticlinal height relative to the withers height, the effect the spinal curvature had on the energy transmission line from the rear pivot point to the forward pivot point, Fig.13 and can be seen in the diagrams Fig's. 14 and 15. ​In studying these drawings it does not require a degree in engineering to work out the direction in which that energy is going to go and just to make it clear where that energy should go once it is received within the forward pivot point; it should be the same as when it leaves the rear pivot point - in appropriate percentages it should be; upward and forward. It should not be downward and forward. In the context of visual impact, think of a free and relatively light forehand v's a relatively tight and restricted forehand or even falling on the forehand. The restriction can be subtle, barely seen, or significant. Overall construction, fitness, willingness to run and even double handling plays a major part in which of these it is to be. In other words, whilst the anticlinal/wither position has an impact on the forward energy transmission line and the fore reach, there are many factors that impact on fore reach. Fig. 13b - Rear and fore pivot points and centre of gravity - trotting. Blue dots depict the transmission conduit. 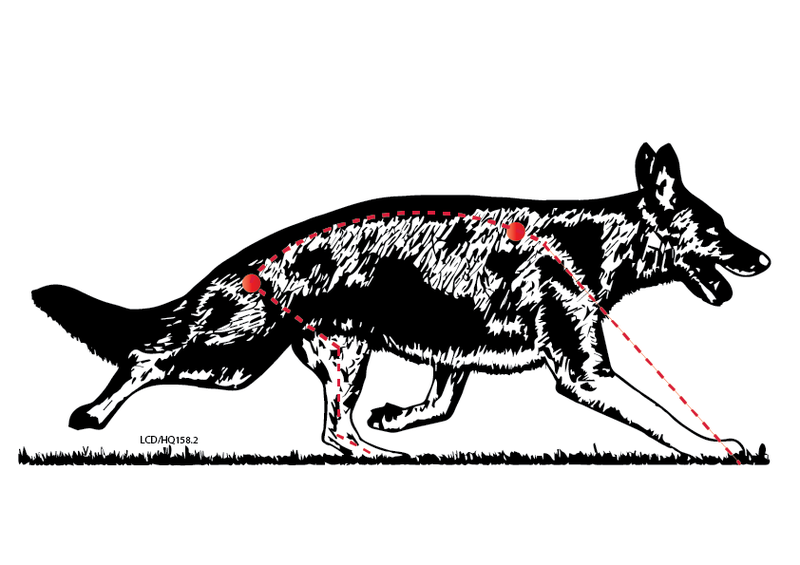 ​Based on many years of observation I can state there are more dogs falling slightly on the forehand today than there were in the past, however 'normalisation' and a lack of fundamental understanding of locomotion and the part the dogs spine plays in locomotion has created an environment where most observers do not see the change that has occurred in this regard. Is there any benefit in having a 'high anticlinal spine position' and downward bending lumbar spine be it curved, straight or somewhere in between? No there isn't, not for any dog and especially if its a trotter. During the trot, the centre of the anticlinal region of a dogs back is a suspension point. When a dog has a peak to its back created by a downward lumbar spine bend, the suspension point becomes a pivot point. This has implication in the locomotive activities of galloping, jumping and trotting. ​Having a 'normal anticlinal spine position' i.e. a position lower than the withers - and curved lumbar spine with its consequential steep croup is beneficial to speed at the gallop though, and that is why all galloping Sighthound Breeds like the Whippet have a curved lumbar spine (and long forelegs). This is a very different configuration to what we are talking about - very different! ​Galloping breeds have a curved lumbar spine (and consequential short under chest) and that is because when the muscles to that section of the back are associated with a steep croup and proportionately long forelegs it (potentially) increases speed at the gallop. With their characteristic curved lumbar spine and steep croup galloping breeds have extraordinary galloping speed but limited powers of endurance and whilst their speed is limited to relatively short distances, what is important to note is notwithstanding the limited fore reach that is imposed on them by their steep upper arm, during the trot they have a free forehand and they don't fall on the forehand. What I am about to say needs to be taken in by supporters of a curved GSD back, especially when its associated with a downward sloping lumbar spine. The anticlinal section of the back seen in Fig. 17 is 'normal'. That is, the dorsal spinous processes are sloping down toward the lumbar spine and the inherent deflection of the spine is still there! The withers rise upward from the anticlinal region, they are well defined and sloping. The withers are not barely sloping and they are certainly not level with or below the anticlinal region - it is to the complete contrary, just as it should be for the withers to be 'optimally effective', especially during the trot. The lumbar spine is decidedly curved but the mean datum height at either end of the lumbar spine is relatively level, its not at an angle, not bending/sloping downward with the L1 high and the L7 low. This is important because it means the hip joint relative to the shoulder joint is on the same approximate horizontal plane, that the hip joint is not positioned well below the shoulder joint. The curvature to the lumbar spine, relative to its degree, creates a steep pelvis/croup. The downward bend to the GSD lumbar spine which is nothing remotely similar to that seen in galloping breeds, does absolutely nothing in regard to increasing speed at the trot nor the gallop, it is to the contrary! 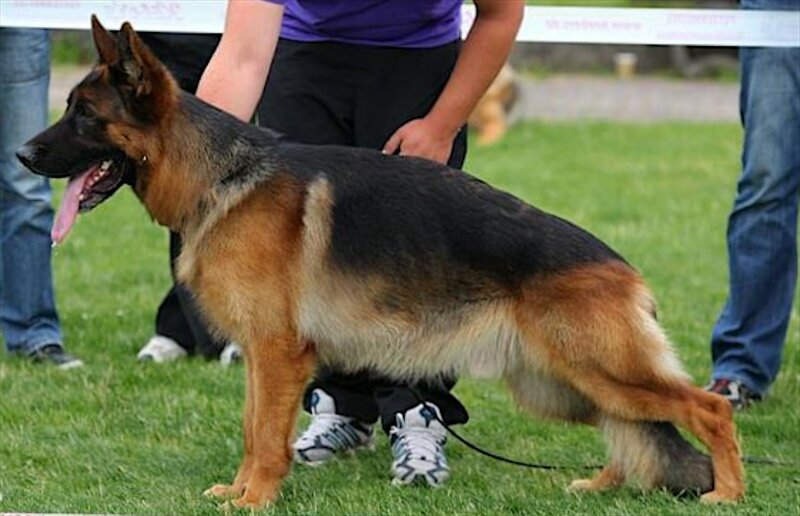 ​The initial anticlinal rise in the German Shepherd Show Dog had a significant knock on effect. When the anticlinal spine region rose, it raised the height of the dorsal spinous processes within the withers region, it brought the tops of the dorsal spinous processes above the top of the scapula. This reduced the withers slope into the thoracic and lumbar section of the back as seen below in Fig's.18 before > Fig 19 after. Again, relative to degrees, this development impeded the withers efficiency. ​As can be seen in the above cross sections Fig's 18a and 18b the rise in the dorsal spinous processes increased the dogs height at the withers in the region of approx. 10/15mm - dependant on how high the top of the dorsal spinous processes are above the uppermost point of the scapula. ​The reduced dorsal spinous processes slope (Fig 20) markedly diminished the withers definition against the back and relative to the degree of anticlinal rise it created a 'moderate' downward slope to the lumbar spine. This in turn increased the angle of the pelvis, brought the hip and knee much closer to the ground ( 50cm/31cm > 43cm/22cm) and when the downward lumbar spine bend was added to this and increased the outward [the inward angle decreased] hindquarter femur tibia angle - i.e. increased hindquarter angulation; in the example shown below 204 degree hind angulation (circa 1950 dog) increased to 242 degrees (circa 1990 dog) and note; the length of the femur and tibia is the same in both dogs. 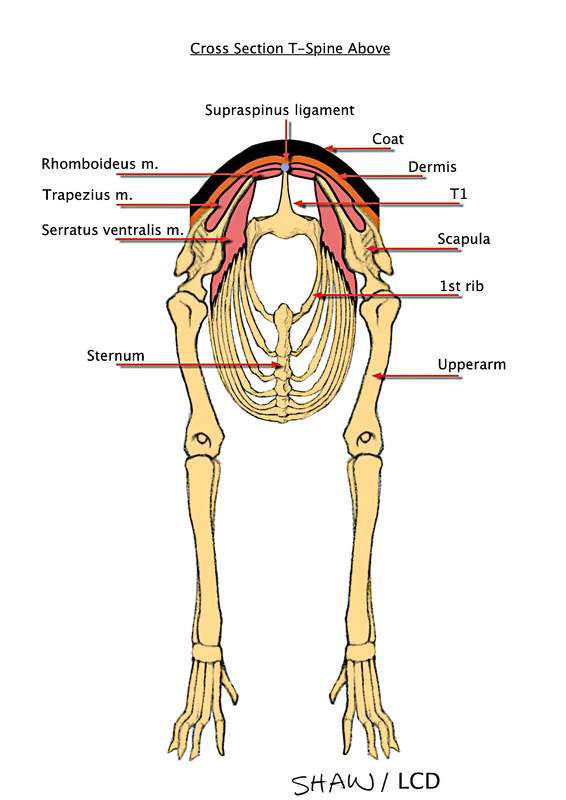 The later development of a too long tibia created an even lower hip and knee position thereby creating excessive angulation and even extreme hind angulation and this brought the tail into contact with the ground, in many cases even running along the ground. 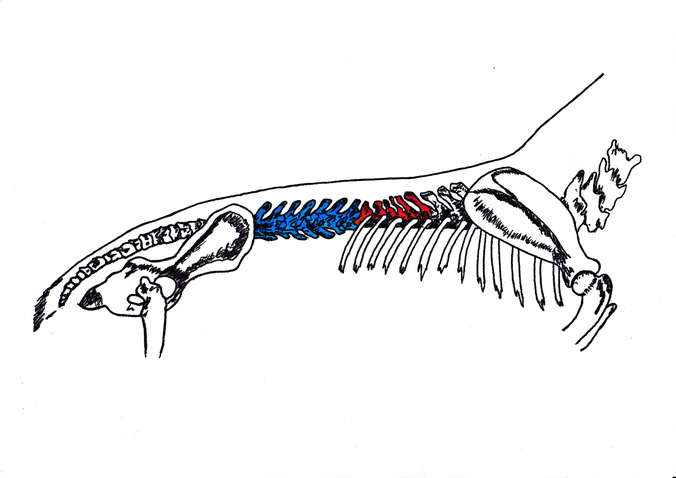 These changes can be seen in three skeleton drawings later in the article. 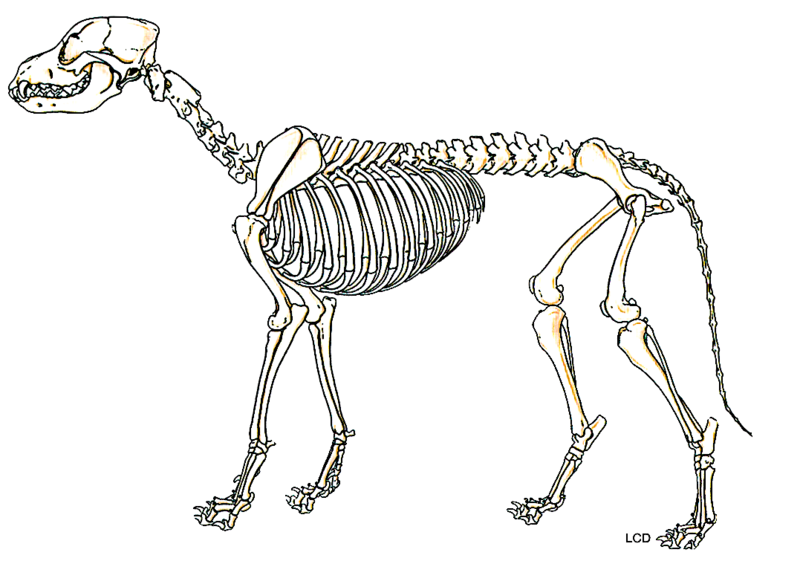 A skeleton that applies to all breeds of working dogs. 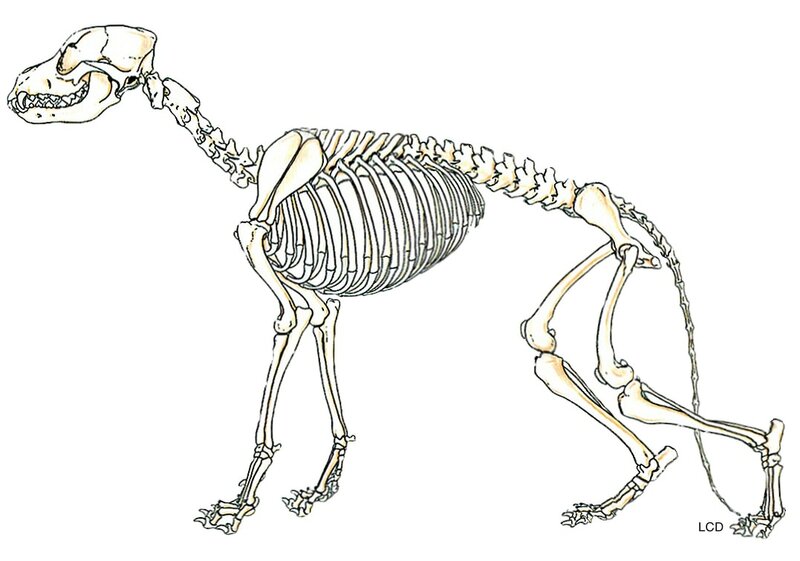 A skeleton of the German Shepherd Show Dog showing the anticlinal thoracic lumbar rise. 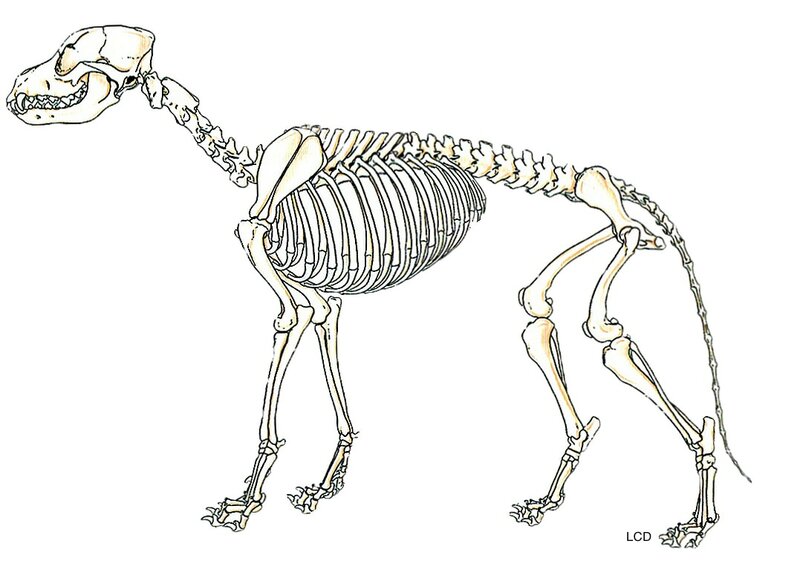 A skeleton of the German Shepherd Show Dog showing the anticlinal thoracic lumbar rise and the exacerbated downward lumbar spine bend that was created by overangulation of the hindquarter. 2 - Skeleton of the German Shepherd Dog showing the anticlinal thoracic lumbar rise with its consequential side effects - raising and leveling of the tops of the dorsal spinous processes to the withers region. This has raised the tops of the first 4 or so dorsal spinous processes above the top of the scapula, diminished the withers slope and the withers definition against the back. Drawn upward the latter section of the rib cage, the under chest. Created a downward curve to the lumbar spine, which has lowered the hip and knee position and inclined the pelvis, increased the hind angulation and brought the end of the tail closer to the ground. ​So where did it come from? That is not an easy thing to answer by any means because the history of this spinal development is sketchy in genetic, photographic and story terms, whether they be written or oral. 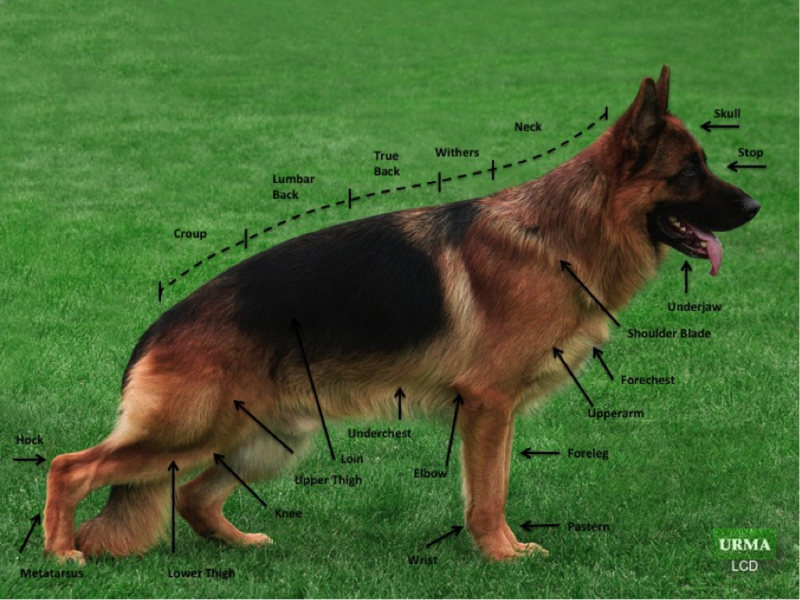 Many people simply refer to German Shepherd Show Dogs as having a ‘curved back'’, but it’s not as simple as that. Like overangulation of the hindquarter there are degrees of the problem, variations in the skeletal configuration that creates it. 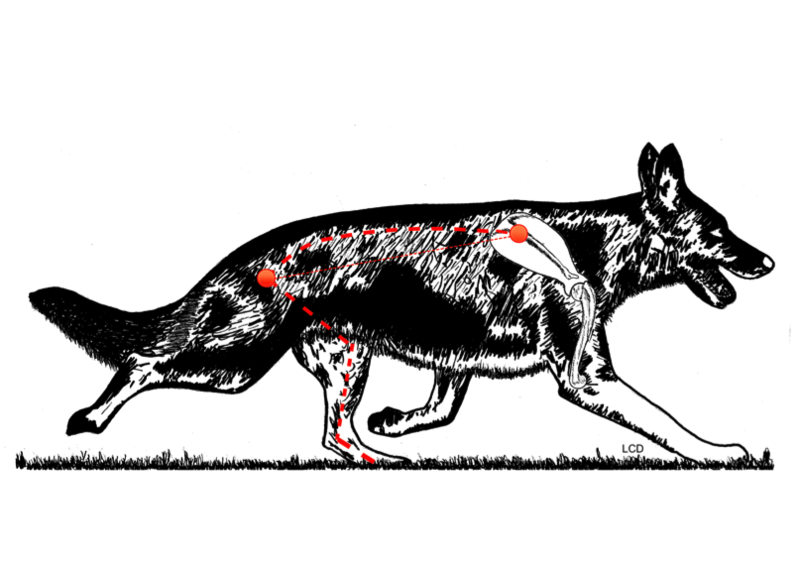 An analogy using overangulation; Two dogs can be deemed to be overangulated but one form of overangulation and its degree is of greater detriment to a dog’s locomotion than another, the same applies to the curvature of the spine. Added to this, genetics is a very complex and random matter. What can seem to be a simple variation of a specific skeletal feature may consist of many different imbedded genetic characteristics. It’s not a case of ‘’one size fits all’’ and this can be further impacted by genetically linked characteristics. Ancestors in close generations can have zero influence whereas ancestors distant can have significant influence particularly via line breeding, which is prolific in our breed – far too prolific. Notwithstanding these vagaries and complexities if we look at the history of the dogs in this period and look at their toplines, a ‘reasonable picture’ does emerge and that picture is worth exploring. Research is made difficult by the fact that photos from the mid 60’s and early 70’s are a bit hit and miss. This was 60 years ago! Many key photographs from this period do not exist, those that do are often of very poor quality and people’s memories of what they saw back then is very often flawed, often romanticised. The reality is if they saw a dog from 40 years ago that they believe would successfully compete in a show today they would be in for a big shock. Their memories of past dogs are often massaged, embellished by what they would like to think existed back then and how that image would translate to that dog standing in the ring today! When I started my research there were several dogs that stood out as key markers and so obvious as to make me think there was genetic mutation in play. However mutation is very rare and I concluded this is not the case here. 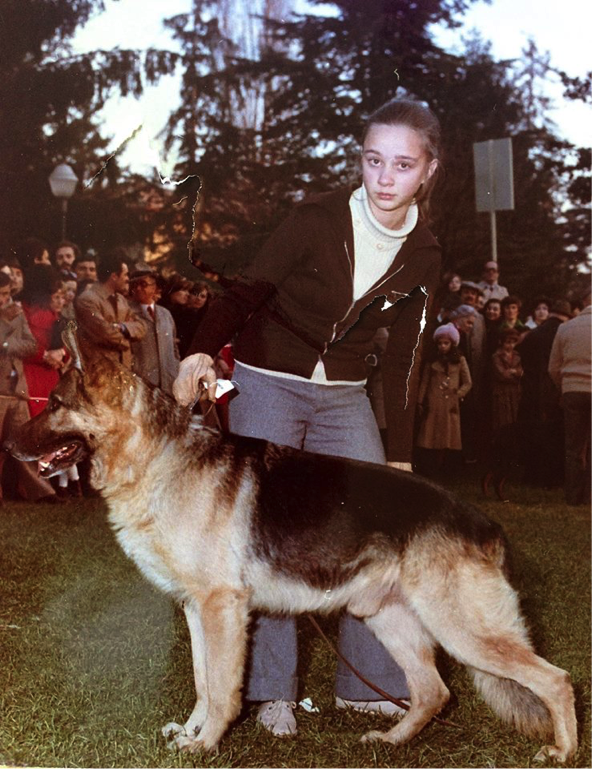 It is a case of what existed genetically within the breed popped up in a small number of dogs, was considered by the SV hierarchy/breeders and judges of great influence as being a desirable characteristic and the development of the breed was then centered on increasing the genetic frequency of that characteristic via the promotion of dogs that were phenotypical of that characteristic and discarding those that were not. In the context of the curvature to the spine; when I study photographs from the early period in which this first appeared and think about dogs I actually saw that exhibited this characteristic, one dog stands out above all others in the context of his promotion, his prolific stud use and thereby his significant breed influence. There are other dogs from various lines supporting the genetic inheritance of this characteristic, but they are of a lesser consequence in the big picture scenario. But before I mention the dogs name, to give some sense of context to the above comments a top ranked VA male of the period in which these dogs were introduced was the German Sieger Bodo von Lierberg. 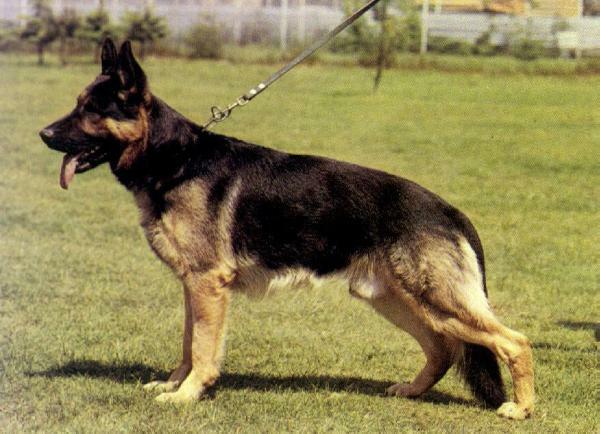 Bodo's topline was typical of what the breed’s German enthusiasts/experts/judges at that time considered to be an example of the desired German Shepherd Dog topline, more specifically, a strong straight back however the opinions regarding the desired topline, be it a ‘show dog’ or ‘working dog’ widens further as each year goes by. Before reading on it is important to take a moment to switch your brain from its usual judicial hemisphere when it comes to looking at dogs and only apply its creative hemisphere. Take a moment to put your mind into the environmental topline headspace that existed for the vast majority of the breed’s enthusiasts at the time of Bodo von Lierberg - the year 1967! 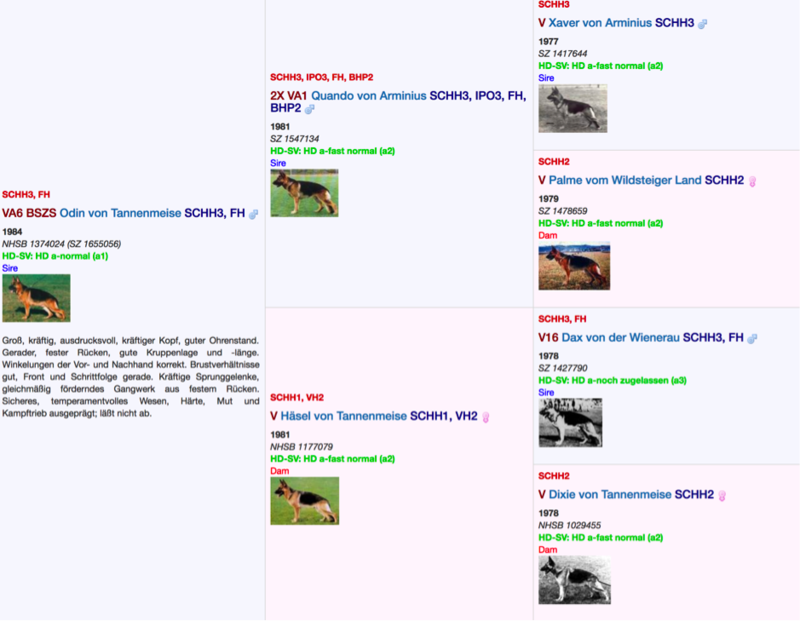 The dog that I referred to previously as a stand out in regard to 'significant breed influence' is Dax von der Wienerau, a dog born about 10 years after Bodo's peak - in 1978. ​Dax was destined to be an ‘extremely influential dog in a narrowing and often inbred blood base ’i.e. Dax is in the bloodline of every VA male from the 2016 Sieger Show and in many cases more than once and without checking probably every VA female too. His breed survey report states ‘very good topline’. 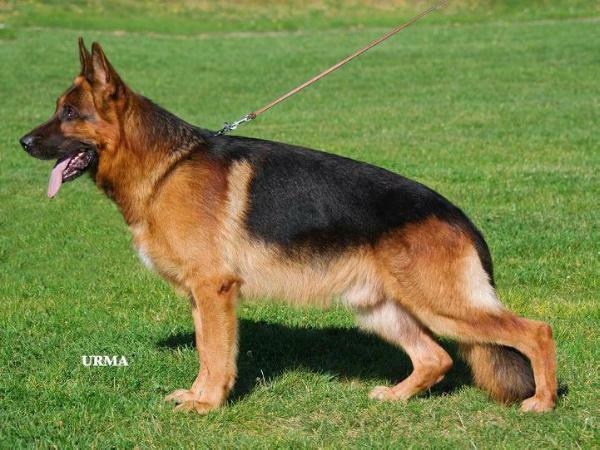 ​My reference to narrowing of the GSD Show dog blood base is ‘’very significant’’ to the subject matter. Dax dog above all others, represents the anticlinal spinal rise and the consequent less sloping/less defined withers, the dorsal spinous processes rise within the withers and steep croups. ​The thoracic spine of a dog is inflexible, it can’t bend. On the other hand the dogs lumbar spine is very flexible, it can and does bend via its intervertebral discs. Keeping this in mind, to appreciate the affect of increasing the downward bend of the lumbar spine via deeper hind angulation, as you look at Dax imagine in your minds eye the withers and the balance of the dorsal spinous processes remaining as they are, this section can slope downward but it can't bend, its fixed. Now picture grabbing Dax at his knee and pulling his knee downward, this increases the femur tibia angle thereby increasing his hind angulation, but more to the point of this article it increases the lumbar spines downward angle and lowers the hip and knee position. 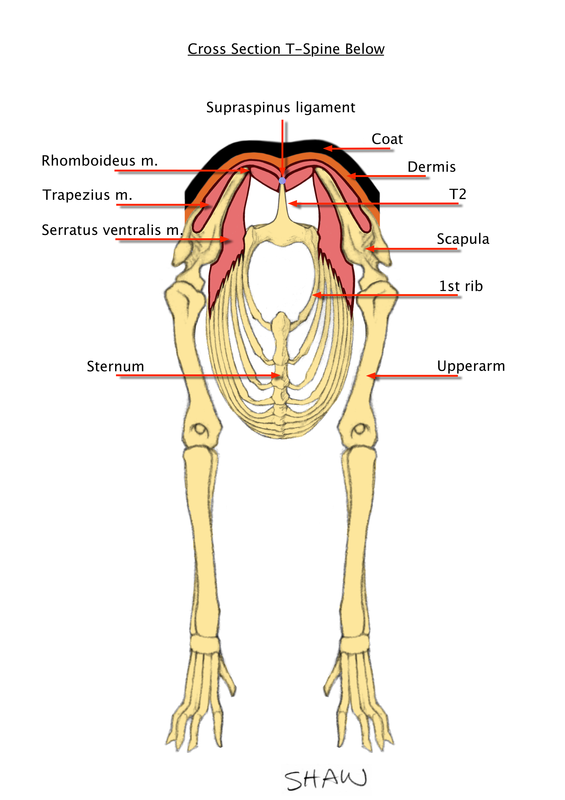 By seeing the back in two sections thoracic and lumbar, it helps with understanding and identification of the issues. The back is a whole but at the same time it has two parts and the lumbar part is impacted by its anticlinal height relative to the withers and by the degree of hind angulation. ​The contrast between Bodo's topline and Dax’s topline is nothing short of ‘profound’. If at that time you were a person standing on the outside looking in, not being influenced by ‘the breed expert’, you would say the contrast represents a deformity of the back! If the dog was a human you would say it was a hunchback. By the 90’s it was entrenched and other than an increase in the lumbar spine angle created by overangulation of the hindquarter, that opinion remains at the most senior levels to this very day! The anticlinal region of the back on Dax is very high, as high as the withers and this has moderately increased the downward angle of the lumbar spine. I say 'moderately' because if Dax had the hind angulation that we see in many show dogs today the lumbar spine angle would be double what you see in his photo and this consequential affect is a very important point to understand. 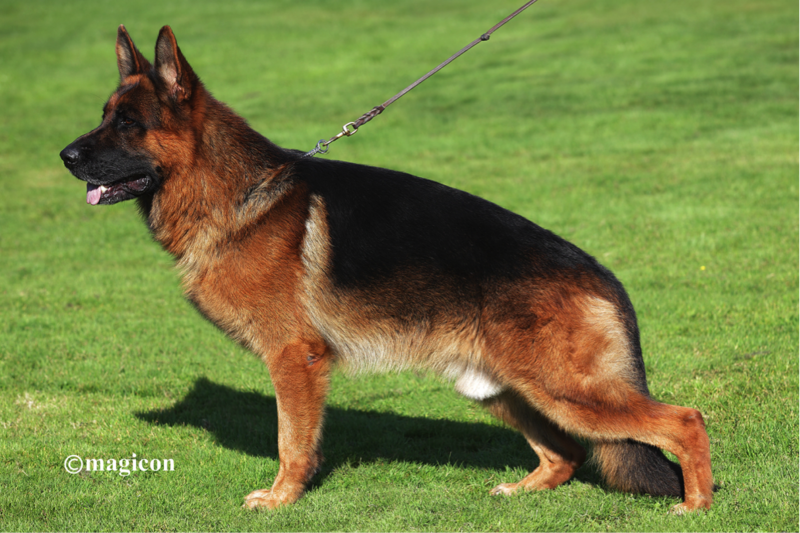 The days of Bodo's topline in the German Shepherd Dog Show ring were over! Bodo's back and over a relatively short period of time thousands of dogs just like him were considered to have a weak back. Dax’s back was the back now considered to be ‘straight and strong’ by those in authority and breed influence and the definition of ‘breed authority and influence’ refers to a very small number of people within the SV who not only hand out blue ribbons but have great influence on other breed judges! If those breed judges do not follow the SV lead, then most exhibitors do not see them as having their own mind and independent thought but instead they see them as being out of touch, even incompetent. The impact the anticlinal rise had on reducing the withers slope, its definition was considered to be neither here nor there. Like weak hocks being a bi product of overangulation level withers was considered to be necessary a bi product of the anticlinal rise, collateral damage! But to how deal with the problem of the withers being contrary to the standard, being relatively level not defined, not sloped? Simple - ditch the universally accepted definition of ‘high withers are withers that are higher than the [thoracic lumbar] back’ and substitute it with ‘high withers are when they are higher than the middle of the lumbar spine section of the back’. Consequently virtually every dog that walks into the show ring today is deemed/critiqued as having high withers! ​As a breed judge, as a breed expert, how do you justify making the statement a dogs back is straight when its actually curved? 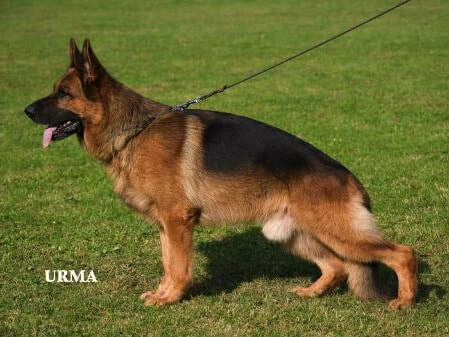 Very simple – as was the case with this dog at a German Sieger Show, ditch the dictionaries definition of ‘a straight back is straight’ and substitute it with ‘a straight back is curved’. 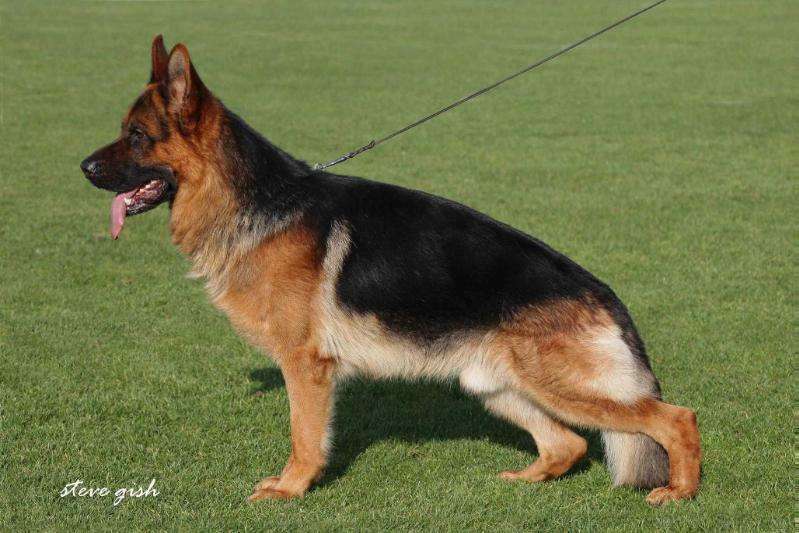 Who in the German Shepherd Show Dog dog sport is going to question it? The breeder and or exhibitor who wants to exhibit dogs that will please individuals in authority in order to win a blue ribbon? The lacking in self confidence and or aspiring breed judge who understands what straight means but wants to be seen by those in authority in a favourable light in order to get another judging appointment? As I keep saying; self interest and for some people even their ego is a more powerful force than idealism. To try and work out where the curvature of the spine came from the logical thing to do is look at Dax’s parentage - to see if his topline was the product of his parentage or a genetic mutation. The tendency in our breed is to only look at the tail male line but that means you are only looking at one small part of the dog’s genetic makeup. I studied all the ancestral lines starting of course with Dax’s father Jupp v d Hallerfarm. ​One can see that Dax’s father had a very distinct curvature to his spine, one so great as to accentuate the lumbar spine downward bend and based on progeny it is reasonable to presume this curvature was passed on to Dax. Did this spinal curvature create the short/drawn up under chest that you see here? Yes, it applies to all galloping dogs with a curvature to the lumbar spine and my observation is German Shepherd Dogs that are not proportionately deep in the fore chest, that are shallow in the forechest and have a curvature of the spine in the lumbar region show this characteristic - there’s another story for another time. 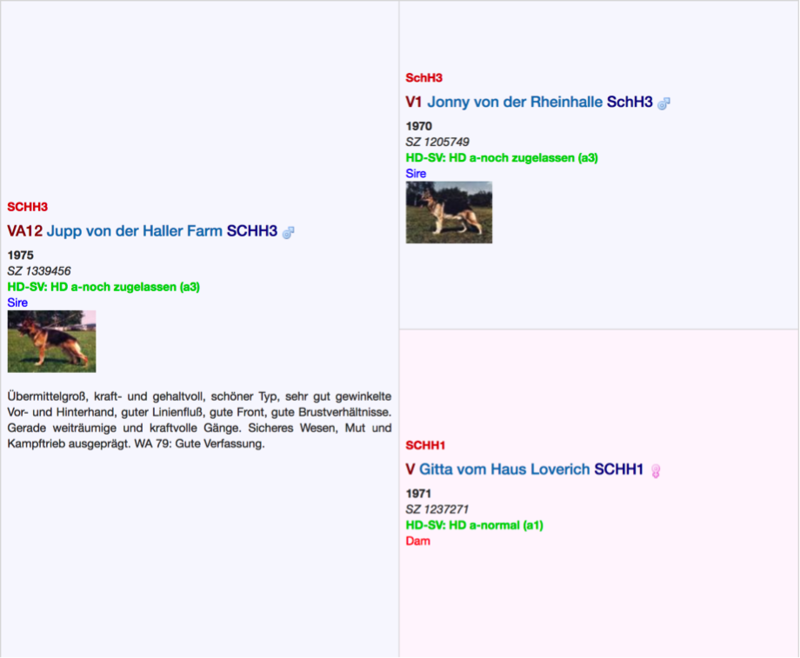 ​Jonny was sired by Mutz v d Pelztierfarm. ​Mutz had an absolutely straight, firm back and one that was totally in line with the standards required topline. When you look at the father line of Mutz there is absolutely nothing to show a too high anticlinal back position never mind a curvature to the spine however a recessive gene/gene alleles had to exist here for the high anticlinal position of the back! Whilst there is nothing to say the higher anticlinal back is not present in a recessive sense I found nothing out of the ordinary on the Gitta von Hause Loverich line. 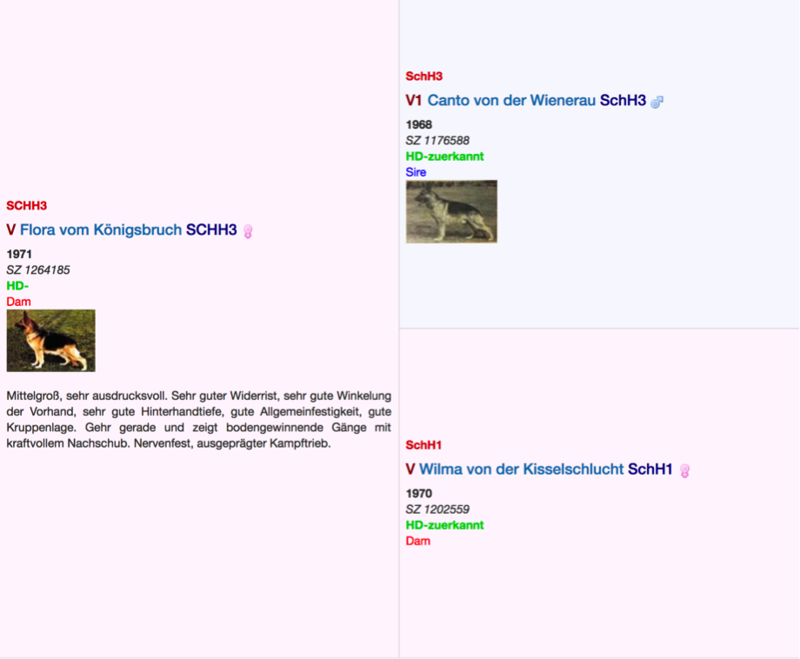 That leaves Flora vom Konigsbruch and her ‘very influential’ mother, Wilma vom Kisselchlucht. Again I found nothing here either, just varying degrees of ‘normal top lines’ that degrade in their firmness as the ancestry goes back in time. ​​I have concluded the high anticlinal spine [curvature to the spine] in regard to Dax von der Wienerau started with Jonny v d Rheinhalle x Mutz von der Pelztierfarm. That just leaves the question, why was a curvature of the dog’s spine promoted in the first place? How could anyone seriously say a curved spine is better than a straight one, especially given the standard states the back should be straight and this is something that is being totally ignored? It doesn’t matter whether you think a curved spine is of detriment or benefit to the dog, what matters is what the standard states. Contrary to what is generally flogged about, it had nothing to do with a curvature to the dog’s spine making the back stronger. My last comment is this; if a curved back was better than a straight back why not amend the standard? Answer; you wouldn’t, and that’s because you would be laughed at! The reason why a curved back happened is because a very small number of people in positions of great power and influence decided they liked the look of it. Yes they may have felt it was stronger, but in scientific terms that's all it was, a feeling and any downside would not have been given a second thought! It was not for for scientifically proven reasons that showed in a trotting dog a curved spine was more efficient than a straight one and that is because because there was none, there is none! They just liked the look of it, and in no small part this was because a number of dogs they bred had this characteristic. That’s the reason, and all the nonsense we hear about how a curved back is better because the back is stronger, that a curved back and low hip and knee position is beneficial to locomotion, that level withers are more efficient then high withers is all a complete nonsense, an insult to one’s intelligence and as I stated earlier, totally contrary to the standard. Regardless of logic, regardless of that fact this characteristic contradicted the standard, most breeders fell in line and they did so because it was a case of ‘’if you don’t like it, bugger off’’. In time some breeders did bugger off but most didn’t. Most stayed, started breeding dogs that had the desired topline characteristics and in a classic kiss arse fashion extolled the virtues of what was a curved spine and of course very often using/paying for stud dogs owned by the influential ‘breed guardians’. Falling in line was the only way they could win a blue ribbon under those entities and after all, if you couldn’t win dog shows what was the point in having a show dog? That self interest and consequential developmental breed process which has permeated many other countries aligned with the SV via the WUSV remains intact today and increased the genetic frequency of dogs with a very high anticlinal thoracic lumbar spine position, consequential level withers, consequential downward lumbar spine bend and consequential too low hip and knee position. They are now deemed by many breed judges to be dogs exhibiting high withers, a straight back and slightly sloping topline. Put another way, they are deemed to be dogs with a straight slightly sloping line running from the base of their neck to their croup - and they are not and the problem with this is two fold; people new to the breed accept what ‘breed authorities’ tell them and because breeders breed what is going to win in the show ring nothing will change if we are saying nothing is wrong, that a curvature to the spine and indeed overangulation is of no impediment to a working dogs locomotive efficiency and in extreme cases its health! I referred to the Odin v Tanenmeise son Jeck von Noricum earlier. The following photograph captures an important historical reflection and record in regard to the profound narrowing of bloodlines in Germany and the significance of Dax von der Wienerau. 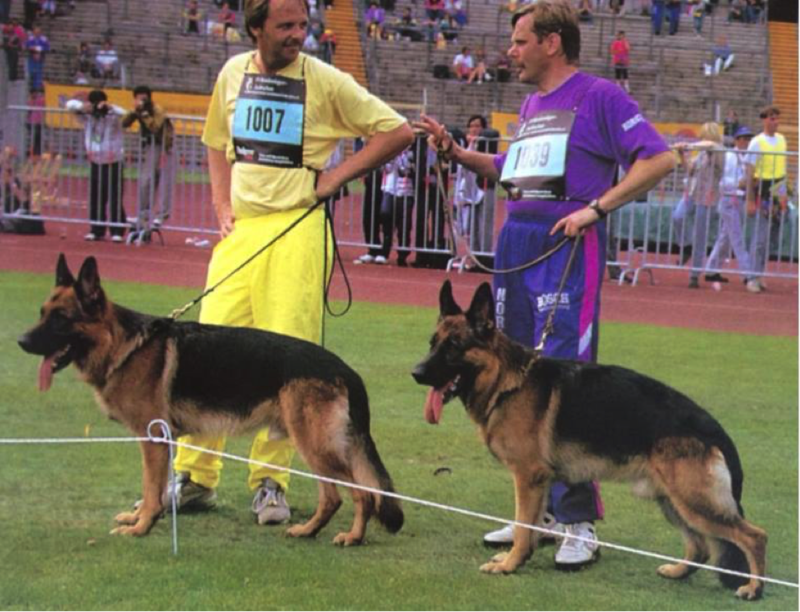 This is a non photoshopped, end of gaiting photo of Zamb von der Wienerau and Jeck vom Noricum - both in a similar standing position taken as Zamb was about to be made the 1992 Sieger and Jeck vom Noricum the 1992 Vice Sieger and in the following year Sieger. In the context of backline, the photo captures an important and transitional German Shepherd Show Dog ‘fork in the road’ period in time. 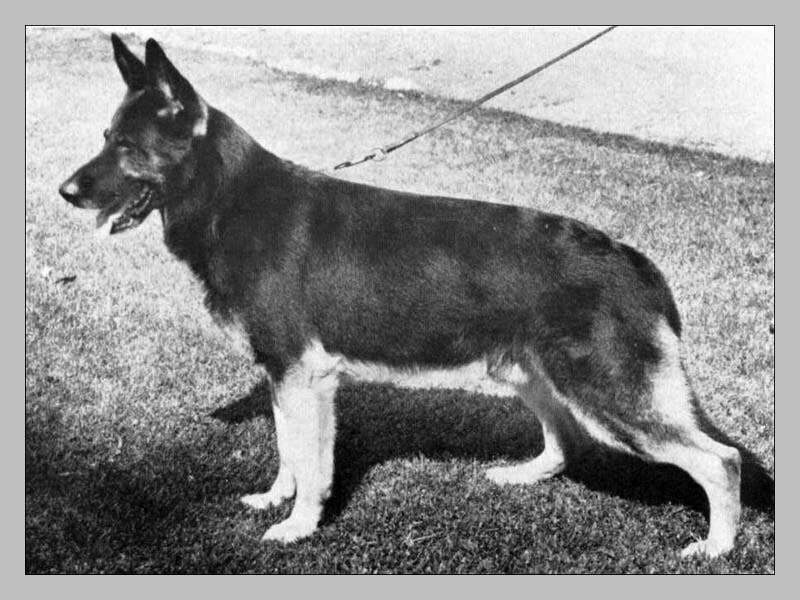 Even though Zamb was Sieger at this show and his bloodline was to have a very significant future impact on the breed the ‘style’ and arguably the ‘type’ of dog that was to evolve in the forthcoming years stands on the right and that ‘style’ is hallmarked by a curved spine, steep croup, low hip and knee position and deep hind angulation. The days of a straight slightly sloping spine, well-angled croup and moderate hind angulation as required by the standard seen here on Zamb were over and to be frank I doubt they will ever return because their is no real will by the SV to do so. The guaranteed future furthering influence for a very high anticlinal spine position and entrenchment of the downward lumbar spine bend. Phenotypical and genetically dominant. In regard to the topline I have to say the thing that gets me more than anything is the acceptance by the SV and most other GSD club magazines of what is often an extreme lumbar spine downward bend, laughably critiqued as a straight back, and if its a top winning dog when it comes to advertising it is generally masked with 'fill in' via the art of photoshopping. This is why so many toplines look the same in photographs. If a photo has been altered the photo should state; 'photograph modified'. ​Many people misuse the word ‘type’. They use the word 'very good type' as an all encompassing 'one word says it all description' that states the dog standing in front of you is a very good reflection of the written standard. My point is this; Grammatically speaking the word 'type' distinguishes one breed of dog from another and the word 'style' describes variations that occur within a breed. A dog may be of a 'typey appearance' be it articulated as 'good type', 'very good type' or 'excellent type', but other than the very rare occasion one might encounter at a Specialty Show of seeing a dog that is not typey i.e. 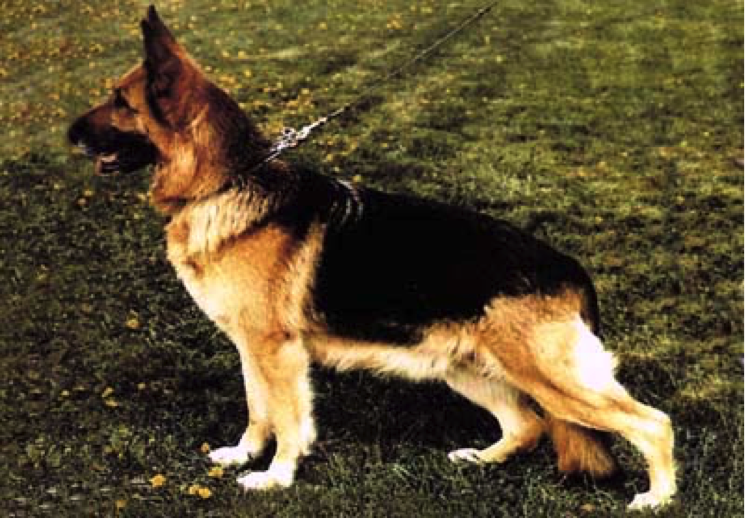 'not typical of the German Shepherd Dog breed', what is being seen is a style of dog not a type of dog and I add; when type is lost so is a breed, sometimes irretrievably. The word type is never going to be replaced by the word style even though it should be. I raise it here because in the true context of the meaning of the words ‘type’ and ‘style’ the words and their true meaning warrant mention. ​I could not finish by at least putting my money where my mouth is and the following drawing is my interpretation of the standard in regard to the topline.